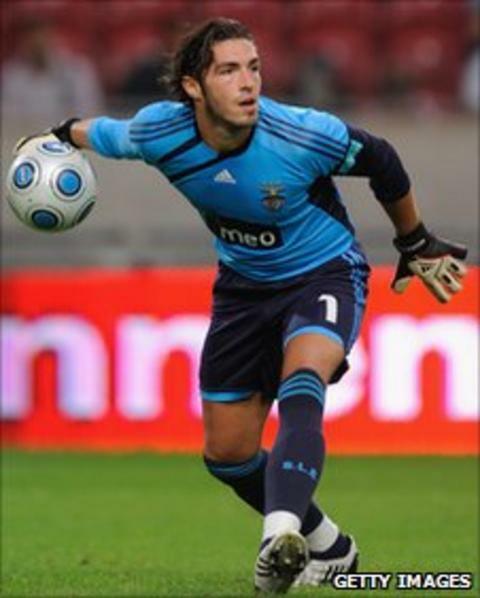 Swansea City have signed Benfica goalkeeper Jose Moreira for an undisclosed fee. Moreira has agreed a two-year contract with the Premier League newcomers. The 29-year-old has one full cap for Portugal and was a squad member at Euro 2004. "It's my dream to play in the Premier League and I'm delighted to get my chance with Swansea City," said Moreira. "I have been at Benfica for 12 years and while it will be hard to leave I need a new challenge in my career." Swansea had targeted a new goalkeeper after out-of-contract Dorus De Vries joined Wolves on a free transfer. Moreira spent his youth career with Salgueiros before joining Benfica in 1999 where he made over 100 appearances. Whilst at Benfica he won two league titles, the Portuguese Cup, three consecutive League Cups and one Portuguese Super Cup. His opportunities at Benfica were limited last season although he was a member of the side which won the League Cup, saving a penalty in the final. And Moreira is confident his exploits with Benfica will stand him in good stead as Swansea prepare for their debut season in the Premier League. "I believe the experience I've gained at such a big club as Benfica and with Portugal will help me achieve success in the Premier League for Swansea," Moreira added. "I watched Swansea's game at Wembley against Reading on the internet and I was very impressed. I can't wait to get started." The goalkeeper has also represented his country at Under-21 level and was a member of Portugal's squad at the 2004 Olympic Games in Athens.